I did a small honours project last year in the University of Cape Town Robotics and Agents Research Lab. In simple terms it involved using a laser scanner mounted on a robot to perform mapping and localization. In fact it was a a new system to make previous methods more stable in rough terrain. It was developed for an Urban Search and Rescue robot, that is currently being built in the lab. I got the top mark for the project, so some one thought it was alright. If you are interested (which you should be, cause everyone knows robots are cool) you can read the full report here, there is also an associated presentation here. If you are interested enough to want the source code you can email me and I'll be happy to organize it for you. The abstract of the write up is below to give you a better idea of what it was on. 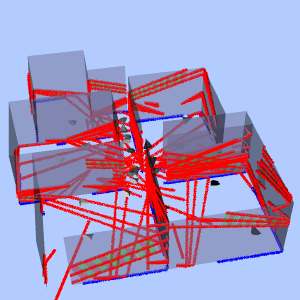 Traditional robot localization and mapping techniques have been developed for simple environments, making them very sensitive to uneven floors. This makes them unsuited for use in many situations, including urban search and rescue scenarios. This paper introduces a novel method that allows traditional 2D laser scanner based localization techniques to be used in environments that are not perfectly flat. The method is efficient both in terms of computation and hardware requirements, requiring only a simple hinge in addition to the laser scanner. The method works by first using multiple laser scans to calculate the relationship of the robot to the level plane, and then projecting the information of the laser scans onto the level plane, after which traditional 2D localization can take place. The method is described in detail and analyzed. Testing and experimentation is done to show that it greatly improves the accuracy of scan matching, the core method in laser scanner based localization.